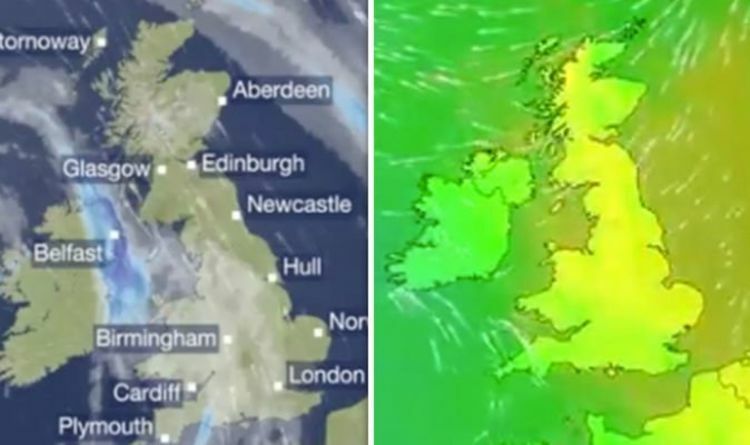 BBC Weather presenter Matt Taylor explained how the UK could see warmer temperatures over the weekend. He added that there still would be chances of heavy rain in some areas but the majority of the country will see temperatures in the teens. Mr Taylor began by saying: “It is looking a lot better in the forecast for Friday for many as it is better weather than we have seen over the last few days. “It is starting to feel a little less cold as well, still a bit of chilly breeze this morning as that is one thing that I can tell you for sure. “It will become a bit dry particularly in northern and eastern areas. “The big area of low pressure that has been with us a number of days it is starting to push its way out into the Atlantic. “Wrapped around it is a weather front which will bring some cloud and patchy rain but it spins itself back in towards southwest Wales and Northern Ireland, producing rain at times. “When it does rain it could be heavy, away from that we couldn’t rule out the odd shower here and there across parts of southern England, the Midlands and maybe towards the likes of Liverpool. Into Friday night and Saturday morning, there will be rain in southwest England, Wales and Northern Ireland and for some areas, it will escalate into heavy rain. For large portions of the night, however, there will be clear skies across the country. The BBC presenter continued: “Saturday we see change with easterly winds with us as the low-pressure system has moved far enough away to keep most places dry. “We could see a few showers down those eastern parts of Scotland and England. “There will be a lot of sunshine to come on Saturday and we could see temperatures around 14 or 15 degrees. “Into Sunday, still some showers possible a bit more widely across England but we will see a bit more sunshine across some of those eastern areas. This will serve as a welcomed improvement after a week of wintry weather and temperatures across the country.